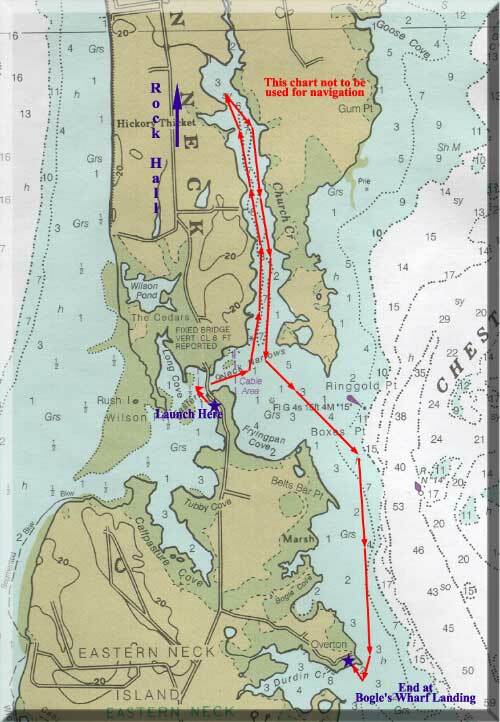 Eastern Neck Landing, Church Creek, to Bogle's Wharf on East Neck Island. Launching just over the bridge to Eastern Neck Island, we'll paddle under the bridge and up Church Creek. At most times of year many migratory birds can be seen in serene natural landscapes in the coves of the Creek. We meander up the shallow creek past large farms and fields on the left, undeveloped woodlands on the right on the peninsula separating Church Creek from the Chester River. We'll glide over huge beds of sub-aquatic vegetation before making our turn. We'll continue on to land at Bogle's Wharf, the only regular boat launching area on the island. From Bogle's Wharf you are greeted with the great expanse of the river and a distant view of Queenstown on the far shore. Copyright Chesapeake Bay Internet Associates. All Rights Reserved.